Duette Honeycomb Shades by Hunter Douglas are the original cellular shades that feature an innovative honeycomb construction designed to trap air for superior energy efficiency. Duette’s honeycomb construction entraps air in their distinct pockets that create an installation that can lower energy usage and utility bills. 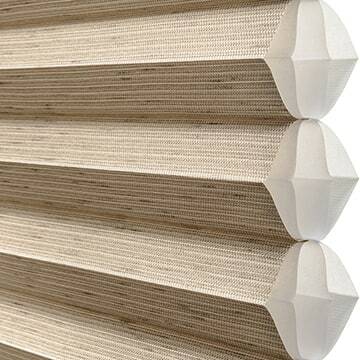 Single cell Duette Honeycomb Shades are available for maximum energy efficiency. Hunter Douglas Duette Honeycomb Shades are available in LightLock. LightLock is the first to offer 100% total room darkening. What makes Duette Honeycomb able to offer 100% darkening is the side channel design that has rows of specifically shaped micro-ridges and unique U-shaped channels that overlap the front and the back of the shades. These features adsorb or deflect all incoming light and prevent the light from coming into the room. Hunter Douglas Duette Honeycomb Shades are available in many sizes, fabrics, colors, and textures. Duette Honeycomb features Hunter Douglas’ Vertiglide operating system for optimal insulation. Vertiglide is designed for vertical doors and windows and features the same fabric as horizontal Duette shades. Hunter Douglas window shades are covered by lifetime limited warranty. 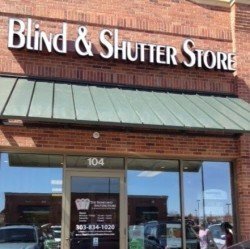 At the Blind and Shutter store, we have a variety of Cellular Shade selections which allows you to choose the shape that fits your window including the style and color. You also have the option to make your honeycomb shades motorized and child safe. If you’re interested in transforming your home with the warm ambiance of sheer window coverings, call 303-834-1020 or fill out the form to find sheers for your Denver area home.